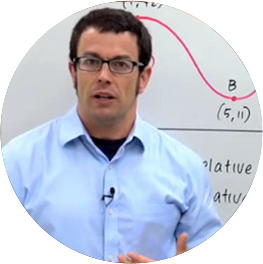 Recognizing certain special polar curves can help us graph them or derive their equations. Circles, cardioids and limacon are all from the same family of polar curves. Other families include roses and conic sections. Students should understand and memorize the equations for these families of polar curves and their special cases. I want to talk about a family of polar curves that's described by these 2 equations r=a+b cosine theta or r=a+b sine theta. Now when b equals 0, all you get is r=a, and this is going to be the graph of the circle. And it's easy to show that. Remember that r=a, you could square both sides and get r squared equals a squared. And r squared when you're converting to rectangular is x squared plus y squared. So this is a circle centered at the origin. And its radius is a. Now what about the other simple case, when a equals 0. Well, if we get r=b cosine theta or r=b sine theta, I'll investigate this one. Its graph happens to also be a circle and that's also pretty easy to show. If you take r=b sine theta and multiply both sides by r you get r squared equals b times r sine theta. Now converting back to rectangular r squared again becomes x squared plus y squared and this become b times r sine theta which is y. So b times y. And I'll collect all terms on the left. x squared plus y squared minus by. If you want to find out what the circle is, you can complete the square on y and remember to do that, you take half of this number -b over 2 and square it. So you add b squared over 4 to both sides. And then you get x squared plus and this factors has y-b over 2 quantity squared equals b squared over 4. And so you can see this also a circle centered at 0 b over 2 and its radius is also b over 2. So let's look at examples of each of these 2 special cases of this family of polar curves. We've got a case where b=0, so r=6. I just wrote this in so you could see the family but this is basically r=6 in blue. A circle centered at the origin with radius 6. And r=0+8 sine theta. Here a=0 and b is 8. Notice that the radius is actually 4 and the center is right here at rectangular 0 4 in polar 4 pi over 2. So just remember that the special cases of this family when either of these coefficients are 0, are circles. We'll investigate the other cases in a moment.